The Menorquin 160 is a super wooden motor yacht charter in Ibiza and Formentera. 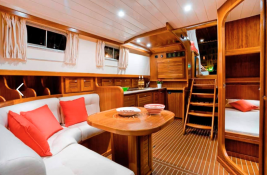 Its shape allows it to offer a space and unparalleled comfort on boats of this size .. This Menorquin 160 was built by Menorquin. With its skipper, she welcomes up to 5 passengers on board to explore Balearics. Menorquin 160 can reach a cruising speed of 16 knots thanks to its 2 powerful 370 hp engines. This skippered motoryacht available for charter in Balearics.